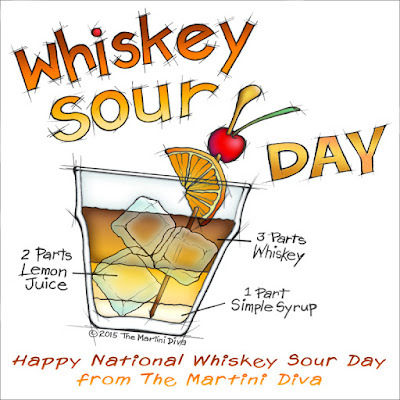 August 25th is National Whiskey Sour Day so today we celebrate one of the oldest cocktails on the happy hour menu. Disguised in my recipe card as a martini for Dad, the Whiskey Sour was more likely a favorite of your grandfather or great grandfather. Mentioned in famed mixologist Jerry Thomas' 1862 Bartender's Guide, the Whiskey Sour has a long history as a classic alcoholic beverage. This venerable cocktail is a member of the Sour family of mixed drinks which consist of a combination of a base liquor, lemon or lime juice and sugar with an optional addition of egg white.